This easy scrapbook layout was designed on the Cricut Design Space using images from Close To My Heart's Artiste Cartridge. You can make this scrapbook page in a variety of sizes using plain colored card stock. 2. Layer 1 - Cut Notebook Image from Artiste Cartridge in White Daisy Cardstock. 3. 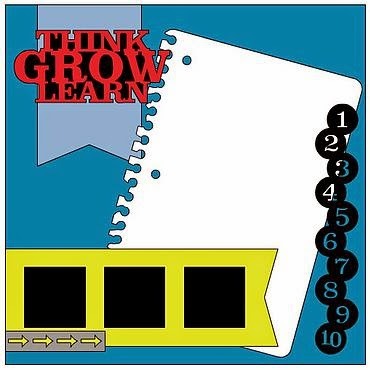 Title - Cut Penant in Glacier Cardstock and Title "Think Grow Learn" in Barn Red Card stock. 5. Accent #2 - Cut numbers border in Black Card Stock.